Artists have used printmaking to create some of their most profound and compelling works of art, yet the basic printmaking techniques remain a mystery to most people. This interactive project provides animated demonstrations of the four main printmaking processes—woodcut, etching, lithography, and screenprint. 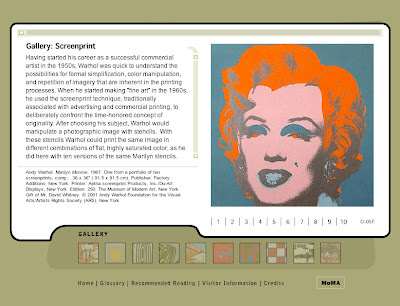 It also includes images of more than forty prints from the Museum's collection in order to demonstrate the range of effects that are associated with each technique. I remember this from college. I can't believe I found it again.